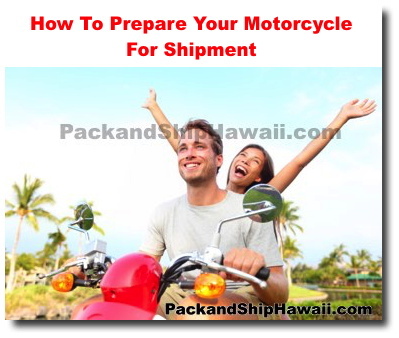 If you are moving states and would like to take your motorcycle with you, here are some steps you can take to prepare your motorcycle for shipping. Drain Liquids - Check with your shipping company if you need to drain the gas from the tank as well as any other fluids prior to shipping. It may be best to do so regardless of their requirements. Be sure to clean your bike and check if there are any leaks before sending it over for shipment. Tighten Fasteners - Your bike will most likely be encounter a lot of vibration in transit to your new destination so be sure that there are no loose fasteners or objects and can get undone or fall off. Remove Valuables - Check all your storage compartments and remove all your valuables before shipment. Check your tires - Make sure your tires are properly inflated before shipping. Keys? - Some shippers may not want to be responsible for the keys of your motorcycle while others may ask for it if they need to start the bike to get it onto the loading ramp. Be sure to check with your shipping company ahead of time so you can make the proper arrangements. Work with a reliable shipping company like Pack and Ship Hawaii. We import and export cargo on a regular basis and have access to reliable shipping lines and ocean freight resources which help keep our rates low and competitive. Click here to learn more about our services and how we can help. Request A Shipping Freight Quote - Special Online Offer! Check out our latest promos and available coupons for our international & domestic freight/shipping services. How about shipping/freight insurance? Do you offer "on-site" estimates? Find the answer to this and other frequently asked questions here. Copyright© 2018-2019 PackAndShipHawaii.com. All rights reserved.